Did you know if you drop a $3000 refrigerator from the bed of a moving van it will roll and roll and roll some more until it totals itself? Or that the best time to paint the kitchen milk chocolate brown is when the color phobic spouse escapes to Huntsville for a few days? How about if you start a project, there will be 100 more little things you forgot in the process? Or that the coast of Japan has 450-pound giant jellyfish? Your daughter will then want to spend time before school looking at pictures of them with you, forcing you to use long forgotten math to figure out how many people and dogs she knows it would take to equal the size of one monster jellyfish. Let’s just say it’s been a week and cooking has been fast and brainless. Much like me today. Please don’t be scared by the canned cream of mushroom soup. It’s really good. I promise! 2. In a bowl, mix together soup, wine or broth, Dijon, thyme, garlic, and pepper. Pour mixture over potatoes. 3. If using, slice the roast half. Then slice each half into 3 pieces. Set aside. 4. In a large skillet, melt the butter until the foam subsides over high heat. Place the pork chops in the pan and season with salt and pepper. Quickly sear the bottom. Turn chops over and season again. When finished place the chops on top of the potatoes. Scrape pan drippings into the slow cooker as well. Recipe adapted from "Better Homes and Gardens Biggest Book of Slow Cooker Recipes". Picture by Laura Flowers. Lovely dinner, I am yet to buy a slow cooker but desperately want one. This looks great! I've been wanting to venture further into the slow cooker world, and this recipe is definitely encouraging me in that direction. Your picture is absolutely mouthwatering. Oh my! You have had a week! 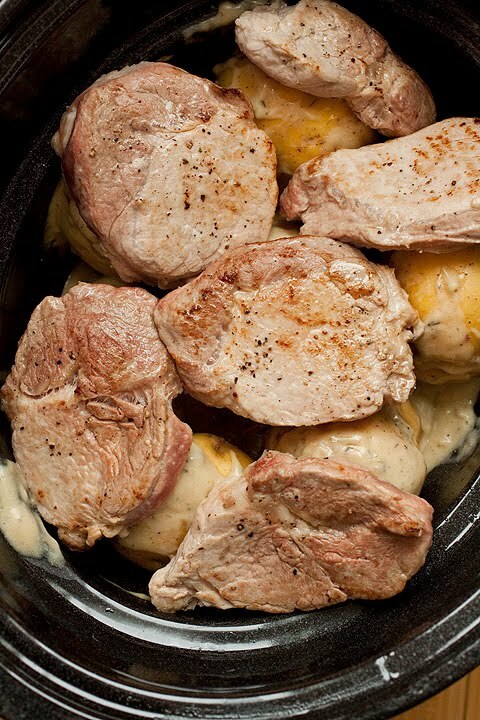 The pork chops look delicious! oof. Math. Hate that stuff. The slow cooker and I, however...now that is another story. Love the sound of this dish! Also, I just posted about your pumpkin knots today. I made them for thanksgiving and they were a HUGE hit! My husband would love this dish. Slow cookers are the best for easy meals - can't wait to try this recipe out. Your corn pudding dish was a hit at Thanksgiving btw. I need to try that painting trick when my husband's out of town ;) What a week! Hope you have a Happy and RELAXED weekend - math free. 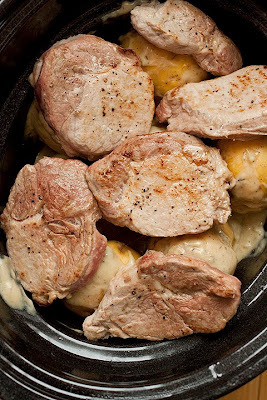 Oh boy;) The pork chops look yummy and with the yukon potatoes-total comfort food! How well cooked would the spuds be? Pretty soft? I wonder about putting them in later in the process.... ? ?